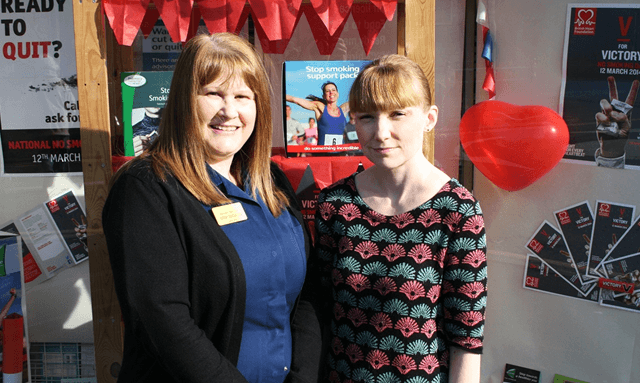 Blackburn with Darwen’s Stop Smoking Service offers a range of personalised support to help you stop smoking. Since coming under Council control in April 2013 the service has helped over 1,800 people to try and quit for good. One person who did just that recently is Dianne Blackmore, from Blackburn, but for her accessing the smoking cessation clinic at her local Geloo Pharmacy, Wellington Street, Blackburn, became about more than just getting help to stop smoking but also getting help to improve her general wellbeing. Dianne started attending the pharmacy in September 2013 and working with Val Bottomley, Stop Smoking Adviser and Healthy Living Champion there, was able to get support and advice to stop smoking but also have someone to talk to about other problems she was experiencing. Val made extra time for Dianne at their weekly sessions, giving her advice based on her own life experiences and going above and beyond just smoking cessation to try and help Dianne. On top of clinics in pharmacies and GP surgeries the stop smoking service is expanding all the time with trained stop smoking advisers now able to provide support in communities where it is needed most. Weekly clinics have so far been set up at Green Lane Community Centre on Thursdays 3-5.30pm and at Blackburn College for students and staff, Wednesdays 1.30-4pm. These clinics offer one-to-one consultation with a trained stop smoking adviser, follow-up appointments, clinic times, quit kits and information and signposting support. More advisers will soon be in place to offer even more help. For further information you can contact the Blackburn with Darwen Stop Smoking Service on (01254) 587999 or email: quitsmoking@blackburn.gov.uk.